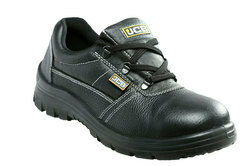 Heat Resistant - 150°C.Oil & Chemical Resistant Anti static Sole. 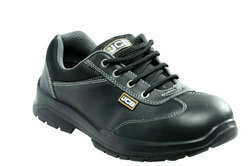 200j Impact Resistant Imported Steel Toe Cap. 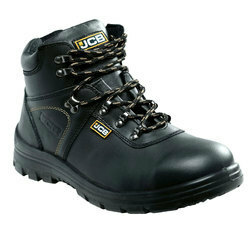 Sole Resists up to 300ºC. 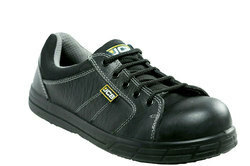 Acid, Alkali, Fat, Chemical & Oil Resistant Sole. EN 345 & IS 15298 (II). Printed Grain Buff Leather Upper. 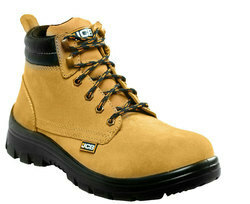 Rust Resistant Epoxy coated EN 12568 marked imported Steel Toe Cap. Padded Collar and Padded Tongue. Molded Stiffener for Additional Support. 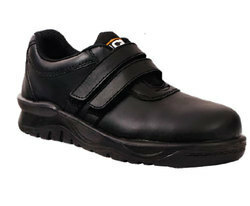 PU Single Density 208 Mould Sole. Nail Less Construction.EN ISO 20345 & IS 15298 (II). 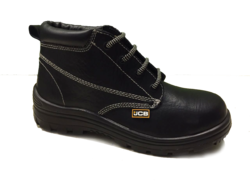 Heat Resistant - 150 DegreeC.Oil & Chemical Resistant Antistatic Sole. 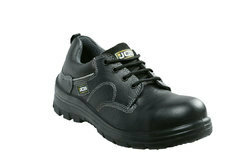 Direct Injected Single Density PU Sole. 4 Brass Eyelet & 2 Hooks for Speed Lacing. 4 Metal D-Ring For Speed Lacing.